Last Thursday, Hubby and I flew to Southern California via JetBlue because Hubby had a business trip in Pasadena, California. For those not familiar with the state of California (of which I'm a resident of the northern vicinity), this U.S. state is very large geographically, hence having to fly 1 1/2 hours to get to the Los Angeles area. If we drove by car, it would take about 7 hours (depending on traffic conditions). So traveling to Southern California is always like traveling to a completely different state. The climate is different. The geography is different. The culture is different. The air quality is different. The differences are so striking that it's really hard to explain to people only familiar with the southern part of our state that we in the northern part have a vastly different living experience. I mention all of this, because I have a difficult time traveling to Southern California because of those differences. Twenty years ago, I lived in Pasadena for a brief blip in time (2 months give or take a day). Since I was a child traveling to the L.A. area to go to Disneyland with my family, I was drawn to it as so many others are for various reasons usually related to the entertainment industry. The dream that brought me there was my dream to work for Disney as an Imagineer. That dream no longer has the vibrance it did when I was a young pup, but every time I visit Southern California I still have to battle with my inner gremlins. Because L.A. is known as the home of "the beautiful people" it always takes a lot of mental preparation (and careful wardrobe selection) for me to be ready to enter that world. This trip was no different. In fact, the problems were heightened because we would be staying at the Westin in beautiful downtown historic Old Pasadena. There's money rolling around there. It's hard for a girl that likes to play in the dirt in her jeans to feel "fancy" enough for that crowd. 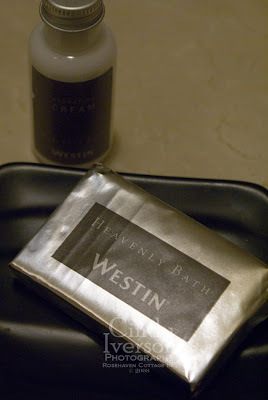 But I screwed up my courage and dove in as Hubby and I drove our rental car from the Long Beach airport north to Pasadena and the elegant Westin. Check-in went smoothly although the attendant at the desk had an air of "I should be a stylist for the Oscars" about him. At the very end of check-in, he casually mentioned, "I hope you enjoy your city hall view." "Hmm. Wonder what he means by that?" I thought to myself, "Guess I'll find out soon enough." Hubby and I went up the elevator to find an elegant and chic room awaiting us with crisp white linens already turned down for the night. Once our bags were deposited Hubby had to leave to go "self park" our rental car to avoid the expense of valet parking (I'm so pleased with how budget-conscious Hubby is for his company). His little errand left me to snoop around our room and discover everything before he got back. It also gave me time to photograph our room before it got messed up by us sacking out for the night. The entire room was a "standard" room and not a suite but it had the feeling of a suite to it. The colors were soothing neutrals that had an understated elegance. One wall had a built-in benchseat spanning its length with crisp round bolsters along the wall. It was quite chic. The bathroom was very spa-like in its decor. The lines of the furniture and accessories had a mid-century Hollywood element to them (so did the fixtures in the hotel hallway leading to our room). The bathroom was "posh" without being "in your face posh". 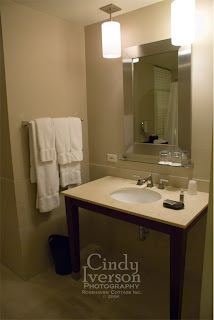 Since I love earthtones and all shades of green, I found the bathroom and bedroom decor quite to my liking. I didn't feel uneasy or out of place. I felt like I could truly relax instead of worrying whether or not I should touch anything. That's a sign of a good hotel in my opinion--classiness without stuffiness. After exploring the room, I ventured onto our balcony, and I discovered what the hotel attendant had meant by "city hall view". The photo at right says it all! I was stunned and it took my breath away. I don't know how many photos I took of this view alone. I wanted to make sure I captured it in just the right way. [Click on the image to see it larger if you like.] I was so excited to show Hubby when he got back to the room! He was appropriately impressed as well. Now I'm not a "country bumpkin", but I'm also not one to be too impressed by worldly prestige, fame, money or designer labels. I often feel put off by that sort of thing while at the same time I don't want to stick out like a Baby Ruth candy bar in a swimming pool when I'm a visitor in someone else's "natural habitat" where those elements are the norm. The following day I got the rental car while Hubby was in meetings. 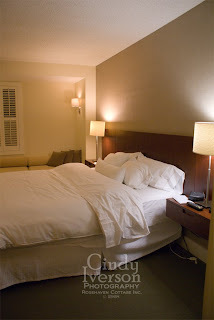 As I explored Pasadena after being gone for almost 20 years, I was pleasantly surprised to find that Pasadena has the same feeling that our hotel room did--classiness without stuffiness. As our trip drew to a close a day later, I found myself saying to Hubby that if we ever have to move because of his job (which I pray NEVER happens), I would want it to be to Pasadena. Seems like that pull is still there just a little bit--but in a more mature and subtle way that was comfortable like the neutral earthtones of our hotel room's decor. Wow, what a gorgeous room! And that view is just incredible! Wicked funny title and baby ruth reference. The view was pretty. Love your view too! Wow...your post was great...esp about the Baby Ruth,,,funny! My Mommie knows just what you mean about the difference between southern and northern California. She grew up in S. California (Orange County) and then moved to N. California to go to school, and never went back. Beautiful and happy you had a great time and came home safe. It's ok to visit, but I never want to live down there! I'll Northern California any day! And just because, I have to ask, how is the painting going? Hee....I'm still in my nightgown! Pretty fancy joint youse guys was stayin' in. Great photos of a great view! The other day you passed an awdrd to Siobhan at Vintage Mosaic Boutique. I went for a visit and enjoyed it very much.Just wanted to say thanks!! My brother is one of the 'beautiful' people in southern California. We can't even get him to come back to New York. 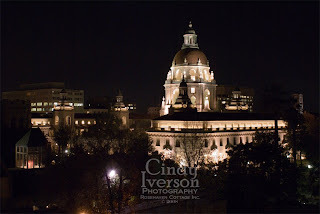 Oh well...I love the photo you took of city hall! Your hotel room looks great and the view is spectacular. I know next to nothing about California, but I appreciate the differences between the northern part of the state and the southern. New Mexico is much the same in that the north and south are completely different. Only my fellow dyslexics will appreciate this... I've looked at the title several times... no kidding... and this time I finally say that it says Pretention... not PREVENTION... so NOW I finally get it! LOL! Dyslexics of the world UNTIE! As it happens I am a bit familiar with California as I have an auntie who lives there and I went to stay with er for a whole month a long time ago. She lives close to Monterey and we drove from there to LA which was quite a trip. Glad to read that you enjoyed yourself, that hotelroom looks very nice and that view is truly wonderful!